Words I Write Crazy: We Have the Cover of The Conqueror's Saga #3!!!! 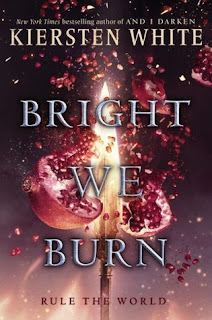 Yeah, we have the cover of Bright We Burn by Kiersten White! This cover is badass! In the article that I saw, it mentioned that it's the bloodiest cover in YA without a drop of blood. Yeah, with the pomegranate, I believe, it looks a lot like blood, and it does have the destruction! Love this cover, and I can't wait to read it! What about you guys? Happy reading!